Deckers Outdoor (DECK) shares are up 2.7% today, as the company gave a presentation at the ICR XChange Conference in Dana Point, California. 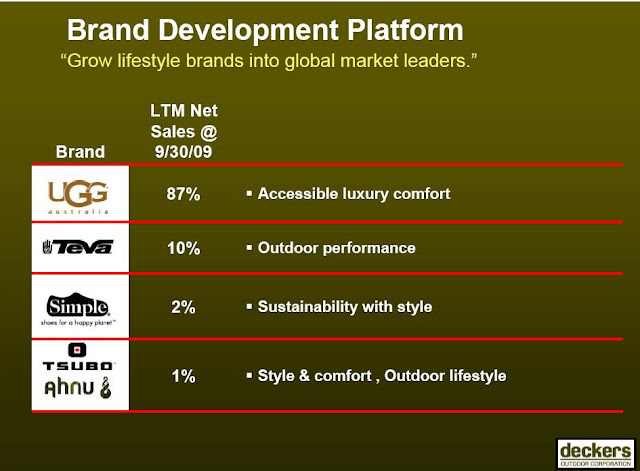 Their guidance for UGG of $900million would take that brand's contribution to top line sales down from 87% of the total to about 82%. With the premium-priced UGG representing a smaller portion of the company's revenue mix, I would expect gross margins to fall slightly, but this could be offset through SG&A leverage. If they maintain 22% operating margins, the company could earn over $12 per share in 2012 and $140million in Free Cash Flow. 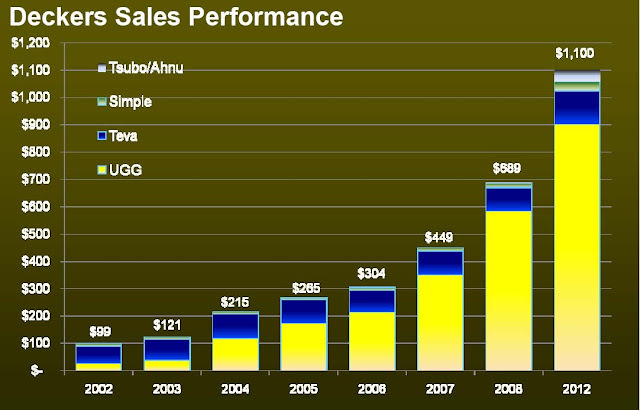 A 12 PE on 2012 earnings of $12 per share would be a stock price of $148, and a 17 PE would get the shares to $210. However a generous 8% Free Cash Flow Yield would suggest a share price of $128. Certainly a well run company with some big earnings ahead of it. I'll look into it further before recommending shares.